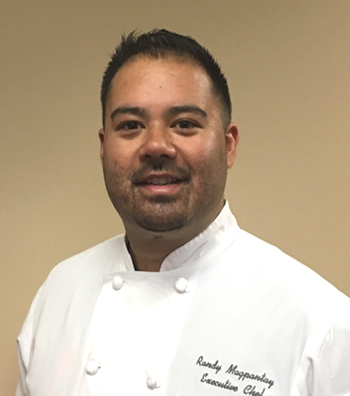 Versailles is pleased to introduce you to Randy Magpantay, our Executive Chef. The concept of homeownership with exceptional lifestyle services is something you'd find only in the finest hotels; you can now enjoy these at Versailles. But this is not your typical restaurant. Chef Randy truly makes your daily dining or your private party experience special. Our residents travel the world, cruising and dining in the most prestigious venues. And yet, they delight in coming home to Chef Randy’s personal and professional accent on fine cuisine. Chef Randy brings to Versailles an interactive approach. He is classically trained in French cuisine at the California Culinary Academy, Le Cordon Bleu program. Prior to Versailles, he wowed patrons of the local restaurant Town with his fresh California cooking. Chef Randy brings his lifelong love of great food, wine and entertaining to each homeowner every day. It's like having your own personal chef at home. His kitchen uses the finest offerings from our local producers and farms. The use of local organic vegetables, fresh fish and seafood, certified Angus beef, free range poultry and seasonal specialties are highlighted in each meal. Chef Randy thoughtfully plans each week's menu, offering a balance of the tried and true comfort foods we all love to dishes that will please your palette. Residents' preferences and opinions are welcome and Chef Randy and his staff take pride in offering exceptional meals to his "family" and guests at Versailles' restaurant. "I really try to cater to what our dining patrons want both in menu selections and in style, and then I add a fresh culinary twist. It's a balance of meeting the culinary tastes and preferences of our residents with the fresh food approach and great service of a great restaurant, day in and day out. We create an event for each individual... This is my trademark at Versailles."